Some people have a knack for taking a bad situation and making it better. They can put a spin on things which helps to improve the situation and get themselves and others out of trouble. 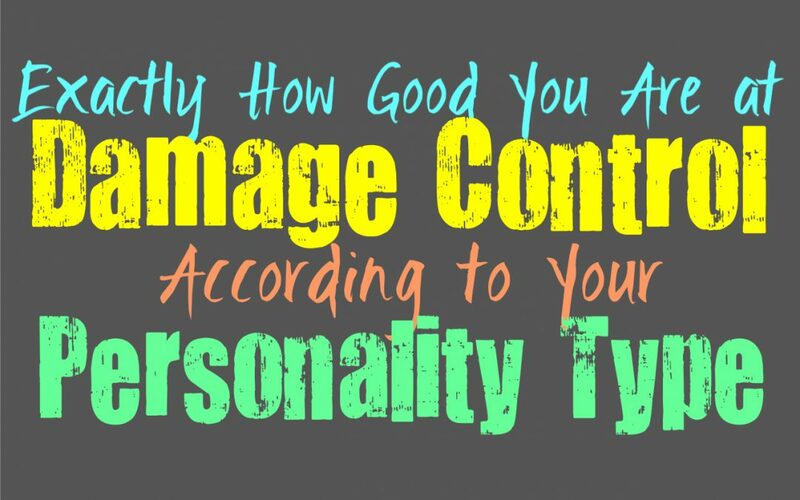 Here is how good you are at damage control, based on your personality type. INFJs are actually surprisingly good at damage control, but it isn’t their favorite thing to do. They can become drained by having to put a positive spin on things and fix whatever mistakes have been made. They are perfectionists and prefer that things are right the first time around, but they do their best to be good at picking up the pieces. INFJs can often be good at playing the behind the scenes role in politics or for people who are in the spotlight, because of their ability to play damage control. ENFJs are excellent at damage control, especially in situations where they have made the mistake. They work hard to fix whatever has been broken or damaged, in order to move forward. ENFJs realize that sometimes mistakes are made and so they are often prepared to make these situations better. They often see the best way to repair whatever damage has occurred, as well as smooth things over for anyone who was involved in this situation. ENFJs don’t like when things go wrong, but they do their best to prepare for this and find ways to make it right. INFPs aren’t really fans of having to do damage control, especially if they feel a situation should not be salvaged. They are capable of working around their mistakes though, and can smooth things over with someone who is upset about what occurred. INFPs are capable of damage control if they truly want to make things right when things have gone awry. Usually the INFPs simply tries to move forward through the mess, and find a way to work around it. ENFPs can actually be good at damage control, since they sometimes get themselves into bad situations. ENFPs can be used of getting into trouble and needing to find ways to play a bit of damage control. When they have upset someone to a serious degree, they want to find a way to make amends or fix this situation. ENFPs usually can find a way through these problems themselves, but sometimes they might just move onto something else. In some situations damage control seems like a waste of their time, so they simply move one to something new. INTJs are capable of damage control, but it isn’t something they want to take part in. They want to be able to get things right the first time so that damage control is not at all necessary. They believe in working hard to ensure that everything comes out perfectly the first time around. INTJs don’t want their plans to go awry and so for them damage control can feel a bit like a failure. While they aren’t in favor of it, they are capable of playing damage control especially since they have often have backup plans. ENTJs often prefer to avoid having to do damage control, since they want things done right the first time. For them this feels like a bit of a failure if they need to pick up the pieces and fix what has been broken. While ENTJs don’t like doing damage control, they are highly capable of it. They often plan ahead and prepare for if things might go wrong, even though this isn’t something they want to happen. They will do their best to fix the situation and find ways to mend whatever bridges might seem burned. INTPs are surprisingly good at damage control, since they can find themselves in messy situations sometimes. Their curiosity takes them down new paths, and sometimes INTPs find themselves wanting to dive into the messier bits of life. They also can be drawn to people who are a bit chaotic, and so they ultimately learn how to be skilled at damage control. INTPs are good at seeing the different patterns and potential outcomes and so they are often prepared for when things go wrong. ENTPs are surprisingly good at damage control, often because they get themselves into trouble. ENTPs dive into new situations and might have a tendency to break the rules a bit, so they get caught up in situations that can be a bit messy. While the ENTP might get into sticky situations, they are often skilled at finding ways to fix whatever has gone wrong. If they do some damage in their actions, the ENTP will find a way to make things better and be capable of moving forward. ISTJs really aren’t fans of damage control, since it means something has gone wrong to start with. They believe in ensuring that situations don’t go the wrong way from the start. ISTJs work hard to get the job done and want to be prepared for just about anything. Their perfectionist nature can cause the ISTJ to become a bit upset if they end up having to enlist some damage control. While this isn’t something they are fans of, ISTJs are efficient people and so they will find a way to fix the problem. ESTJs aren’t fans of having to do damage control, since they would rather things not end up broken in the first place. They believe in working hard to ensure that everything runs smoothly from the very start. They value efficiency and can certainly be perfectionists, and so they often believe that things should be right the first time around. While they believe in ensuring that there is a certain level of perfection in everything they do, ESTJs will do their best to do damage control if they need to. ISFJs are capable of damage control, especially since they find themselves picking up the pieces often when other people make mistakes. ISFJs entangle their lives with their loved ones, and this sometimes gets them into situations where they need to play damage control. ISFJs often know how to fix situations that appear broken, and will do their best to smooth things over even when it seems completely amuck. They work hard to make sure their environment has a sense of harmony, and so damage control is certainly in their list of skills. ESFJs might be perfectionists but they are actually rather good at damage control. They connect themselves with their loved ones and so they can sometimes get into situations they normal would not because of this. ESFJs want to take care of others and sometimes this means having to do some damage control for the sake of those people in their lives. For the ESFJ this can be a bit draining after a while, but they are naturally very good at damage control. They often prepare themselves for when their loved ones make mistakes and they will need to fix those situations. ISTPs can sometimes get themselves into sticky situations since they are curious people who enjoy a bit of trouble sometimes. They are natural problem solvers though, and this often helps the ISTP do some damage control when needed. In some situations the ISTP won’t be too worried about damage control, they will simply move on to the next thing that occupies their curiosity. While they can appear a bit chaotic sometimes, ISTPs are capable of handling their own business. ESTPs are curious and adventurous people who don’t like having to follow the rules, this can often get them into troublesome situations. Because of their natural ability to get themselves into sticky situations, the ESTP often has to learn how to do damage control. They often know how to clean up these big messes or find ways to mend fences that were previously broken. They will certainly do their best damage control, but there are times when their charm can’t quite get them out of trouble. ISFPs can sometimes find themselves into messier situations, simply because they are curious people. They try to avoid getting into too much trouble, but they aren’t really great at thinking ahead. ISFPs don’t naturally see around the corner with most things, instead they simply see what is in front of them. This causes the ISFP to get themselves into trouble and they might need to find ways to get bailed out. Damage control really isn’t their biggest strength, but they often have loved ones who will jump in and help them out. ESFPs are naturally curious people who often find themselves getting into trouble because of this. Their desire to live in the moment and enjoy what life throws at them, can sometimes create situations that aren’t entirely desirable. When the ESFP finds themselves in a bit of trouble, they often look to the people who love and support them. While ESFPs might get upset when these things occur, they often have people who will do the damage control for them.